Alfred Hitchcock’s 1950’s psychological crime thriller, Strangers on a Train, was based on Patricia Highsmith’s novel of the same name. Now the creepy tale, transformed for the stage, makes it’s London debut at the Gielgud Theatre from November 2013. 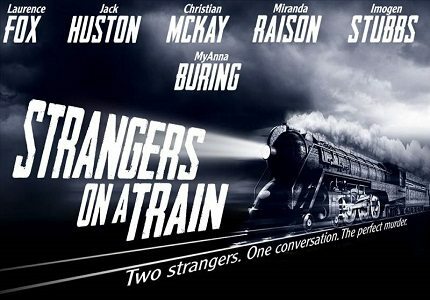 Directed by Robert Allan Ackerman, Strangers on a Train stars Laurence Fox as Guy, Jack Huston as Bruno and Imogen Stubbs as Anne. Other cast members include Christian McKay, Miranda Raison and Myanna Buring. Strangers on a Train is a terrifying crime story fixated on prospect of a double murder. The show contains violent imagery and scenes of an unsuitable nature for young children. Teenagers may enjoy the show when accompanied by an adult.